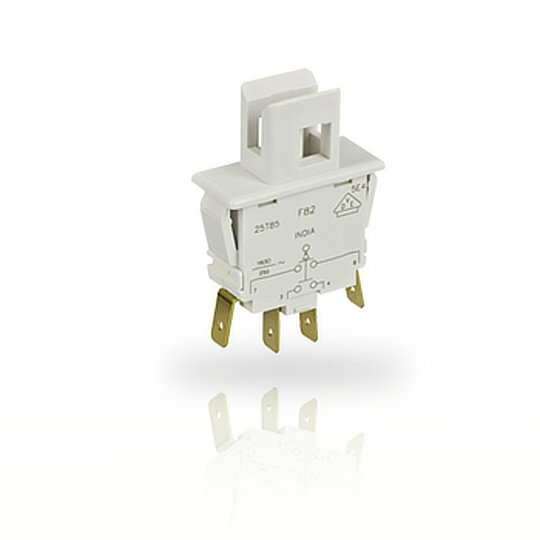 The F8 series of line-interrupt pushbuttons from ZF are single or double pole switches with double throw and double break operation with momentary action. Electrically ratings of either to 16A at 250VAC or 10A at 400VAC depending on model and with a mechanical life of 50,000 cycles. The F8 series of line-interrupt pushbuttons from ZF are single or double pole switches with double throw and double break operation with momentary action. Electrically ratings of either to 16A at 250VAC or 10A at 400VAC depending on model and with a mechanical life of 50,000 cycles. The F6 series comes with quick connect terminals and snap-in panel mounting for quick and easy installation into panel cut outs of 36.7mm by 13.97mm and the choice of basic case housing or with button barrier housing. The F8 series is perfect for such as Control Panels, Robotic Controls, Vending Machines and Parking Meters.